Outrunning Those Just Behind You. An email exchange I had with another workshop instructor dislodged something that I’ve been meaning to reinforce on the site for awhile. Article on dslrbodies.com. The Embedded Adjustments Problem. I’m getting a ton of mail from folk who’ve been using Capture NX2 for a long time who are panicking. As well they should, given Nikon’s NX-D changes. Let me describe the problem. Article on dslrbodies.com. How Smartphones will Continue to Kill Cameras. Who said that you can only have one sensor or one lens in a smartphone? Article on gearophile.com. Panasonic GM1 Review. Meet the winner of sansmirror’s Best Entry Mirrorless Camera of 2013. Article on sansmirror.com. Finessing Reality. Nikon is apparently claiming that “it’s difficult to keep the Df in stock in some countries.” If that’s true, what does it mean? Article on dslrbodies.com. Sigma Rebates. My usual analysis of which lenses you might want to take a closer look at given the newly active instant rebates. Article on dslrbodies.com. Looking at Strategies in the Rear View Mirror. I clearly see the new Capture NX-D as a step backward, yet it is still executing a strategy that I think has now clearly proven to be not so great. Article on dslrbodies.com. Nikon Issues New D600 Advisory. A week after the first D600 class action suit was filed, Nikon has issued a new D600 service advisory. Article on dslrbodies.com. Note: Nikon says that they will refund shipping costs for those who have already had their cameras serviced if the customer paid for them and can provide a shipping receipt. They also claim that they’ve asked dealers to exchange any existing inventory. Nikon is also emailing customers who’ve already had the servicing telling them that it’s not necessary for their camera. Capture NX-D Nails Nikon Scan Coffin Shut? It appears that support for Nikon Scan NEFs is now dead at Nikon. Article on filmbodies.com. Capture NX-D Beta Announced and Released. Nikon heads into a new future with raw conversion software. Article on dslrbodies.com. Nikon Sued Over D600 Faults. At least one law firm has now officially filed a class action suit against Nikon. Article on dslrbodies.com. Warning Bells Sound. It does not look good for serious camera makers. Article on dslrbodies.com. Canon Retreats? The news out of Japan is that Canon is contemplating getting out of the low-end compact camera business. Article on gearophile.com. The Firmware Update Woes. We’re now deep into the firmware updates for most of the mirrorless systems. Read article on sansmirror.com. Why Legacy is So Tough to Break. Grand total: there are about 106 million digital interchangeable lens cameras that have been made and shipped by the Japanese companies in 14 years. Article on dslrbodies.com. Fujifilm Update Day. Three lenses and all five cameras get firmware updates today. Article on sansmirror.com. The Kowa lenses announced at CP+ were added to the lens database on sansmirror.com. 8.5mm, 12mm, and 25mm. The CP+ Interviews. 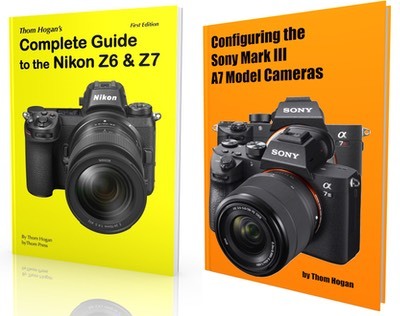 Two digital photography sites did sit-down interviews with Nikon at CP+. Article at dslrbodies.com. You might notice a new site over there in the right column. I finally got my mom onto the Internet, and she is finally showing and selling some of her paintings on her Web site. Like me, she’s mostly focused on nature and wildlife (note her Lilac Breasted Roller painting, which used one of my photos as reference). Note also that I’ve got some more gear on sale in my 2013 Spring Cleaning sale ;~). At the CP+ trade show in Japan Nikon didn't announce the details on the D4s, while Tokina showed a new 24-70mm f/2.8 zoom and announced that their upcoming 70-200mm f/4 had undergone some minor changes and should be available in May. New standards for XQD cards were announced (XQD 2.0), now with a potential speed of 1GB/s. Apparently the weather in Yokohama was as bad as it is here in Pennsylvania, because the Saturday session of CP+ was cancelled due to weather. Can You Trust the Camera Makers? Let me first tell you what prompted this article, then let me back into a little history, and eventually I'll give you an answer. Article on dslrbodies.com. Olympus Expands Lens Set. Olympus pre-announced two more m4/3 lenses, which brings to three the coming Pro lenses. Article on sansmirror.com. Sony Announces A6000. Sony today announced the A6000, the successor to the NEX-6 and NEX-7, blending attributes of both and moving several key technologies forward. Article on sansmirror.com. The New State of Mirrorless. From time to time I write about where we are in terms of desirable photographic traits in the mirrorless market. It's time for a quick update. Article on sansmirror.com. The New Sigma DP Quattro Cameras. Updated. Sigma is revising their DP compact camera lineup. While the lenses don't really change (19mm, 30mm, and 50mm), the design of the camera does and so does the sensor. Article on gearophile.com. Nikon Lens Rebates. As usual, before I present an affiliate link you can use to help this site, I'm going to tell you what you should think of the deals. Read article on dslrbodies.com. Tamron 150-600mm f/5-6.3 lens is now shipping. Panasonic GH4 Camera Introduced. Today Panasonic introduced the latest push of the GH series into serious video: the GH4. Read article on sansmirror.com. Camera data on this page. Nikon introduced six new Coolpix, which are basically all iterations of existing models. Panasonic G6 and GF6 get updates. Article. Nikon D3300 and 35mm f/1.8G lens shipped in the US today. Camera Company Financials. Updated. Canon, Fujifilm, Nikon, Olympus, Panasonic, Ricoh, and Sony have reported their quarterly earnings, while CIPA published its final 2013 numbers. Find out what it all means on dslrbodies.com. My Answers to the Unanswered Questions. Last week I introduced the questions, this week I answer them. Article on dslrbodies.com. Fujifilm Rebates. Updated: US$100 to US$200 off X series bodies, new X-E1 prices, lens rebates start on the 8th. Article on sansmirror.com. Japanese Camera Shipments. CIPA has reported the 2013 shipment numbers. My estimates made in April of last year were off by by 0.002%. I need to play the lottery today ;~). But the bottom line is not very encouraging, nor are the 2014 forecasts. Article on dslrbodies.com. The Internet is Fickle. Less than six months ago the buzz was all about the Panasonic GX7. A month later, the Olympus OM-D E-M1. A month later, the Sony A7 and A7r. Now after a short break for Christmas-related selling, the buzz is back and centered on the Fujifilm X-T1. Article on sansmirror.com. Why 4K? Here's Why Not. A lot of folk are asking me about the Nikon EU product manager's comments about Nikon "will be looking into [4K video] for the future." It seems that a number of folk think that this will get Nikon "back into" the video game. Article on dslrbodies.com. Olympus OM-Ds Compared. A quick table of the differences between the three OM-D models can now be seen on sansmirror.com. Zeiss Touit 50mm Makro-Planar Launches. Zeiss officially announced the 50mm Touit macro lens for Sony E-mount and Fujifilm X-mount systems. Article on sansmirror.com. Lens data page.